Puzzler stage gloriumptious puzzle to honour Roald Dahl - D.C. Thomson & Co. Ltd. The World’s BIGGEST dot-to-dot comes to life! Relaxing puzzles for adults have gone dotty! The UK’s leading puzzle publisher Puzzler Media launched the monthly magazine CREATIVE DOT-TO-DOT in June and already it’s one of their most successful titles. To show how creative a dot-to-dot can be they’ve made what is thought to be the world’s biggest line and point puzzle, recreating a classic image from Roald Dahl’s BFG. Dahl’s books often encourage adults to learn from children and embrace the idea of play. It’s a maxim that fans of Puzzler magazines will know well as they take time out from the hustle and bustle of modern life. Everything about the BFG is big, so this puzzle had to be huge. A specially-created 1,000-dot puzzle was commissioned featuring Sophie and the BFG. This was then filled out by hand in the gardens of Surrey’s Botleys Mansion as a giant projector beamed the process live onto the side of the stately home, which is 12m high by 25m wide. It is believed to be the largest-scale dot-to-dot puzzle ever created. 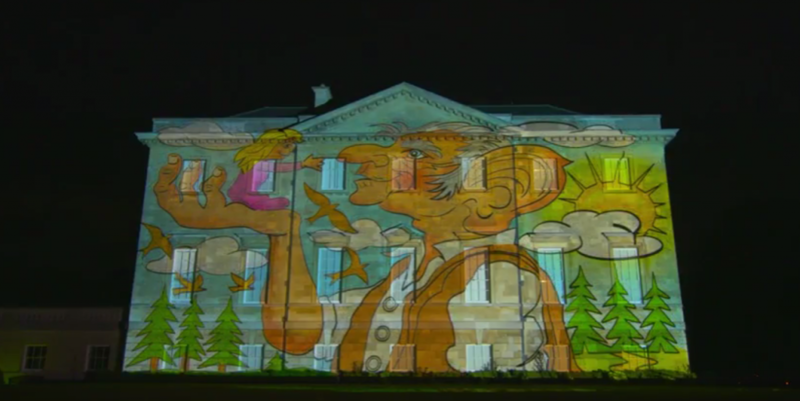 The brilliantly intricate homage to one of the country’s greatest storytellers took an hour to complete on the hottest night of the year, a few days before the UK release of Steven Spielberg’s big screen adaptation of Roald Dahl’s much-loved fantasy tale. Mark Whiteway, Publishing Manager of Puzzler Media said: “We’ve been publishing dot-to-dots in our magazines for over four decades but in the last year we’ve seen requests for this kind of puzzle go dotty. So we came up with CREATIVE DOT-TO-DOT, a magazine dedicated to this jollysome, stress-fizzling pastime. Fans of CREATIVE DOT-TO-DOT will be able have their own go at completing the phizz-whizzing puzzle as it will be included in a special double-page feature of the September issue of the magazine. Click here to see the gloriumptious dot to dot puzzle come to life.